Continuing to be crafty for each holiday for my 30 before 30 list! Here’s my problem – I have an idea of what I want to do, then wait until it’s too close to the holiday, then can’t find the exact materials I wanted. It always turns out perfectly fine, but my shopping trip takes a little longer as I have to get creative on my feet with whatever is available in the store. I think this one especially worked out well – I wanted to do a wreath of red/pink/white balls/ornaments, but alas could find none. 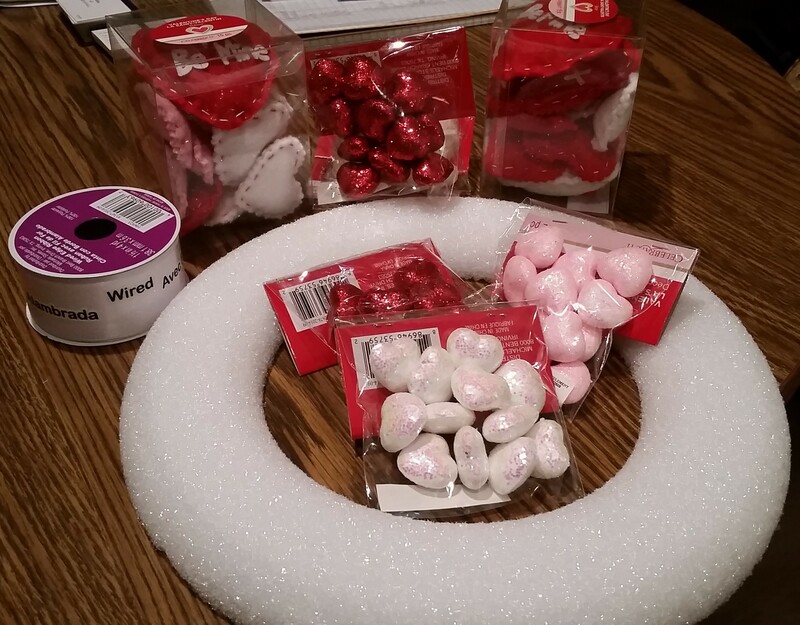 So I just raided the Valentine’s section. I should get more creative, as I make a wreath for most holidays, but other people get to enjoy the wreath in my hallway, whereas if I made a different decor item I may be the only one who gets to enjoy it. Instead of balls I found some felt hearts (which you could make yourself) and some pink and red sparkly foam hearts (kind of what I was looking for). I just bought it all and would return anything I ended up not using! Wrap the wreath in whatever ribbon you bought. I used a white silky wired ribbon. I don’t think it really matters. 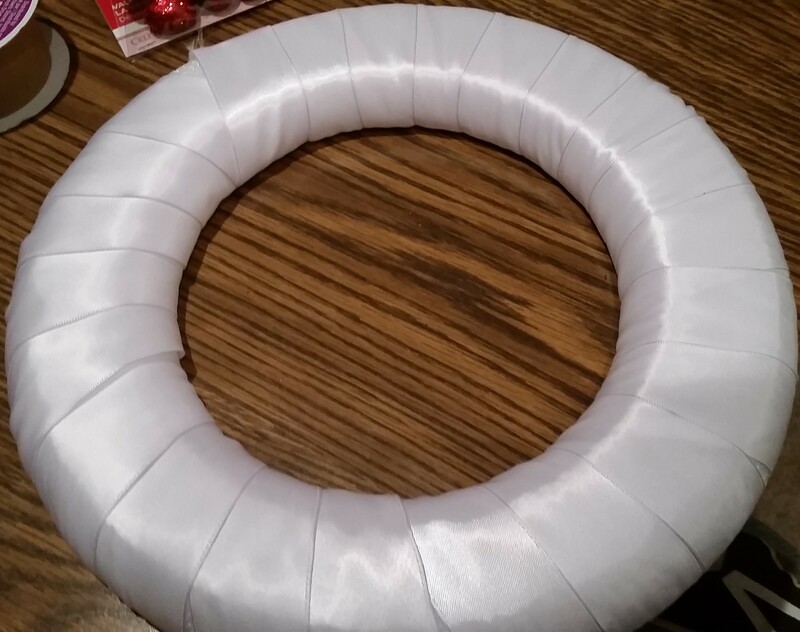 Note: I used a 12-inch wreath and 1 spool of ribbon exactly covered it (barely). Then just glue everything on – no rhyme or reason needed! I glued all the felt hearts on first, then filled in the little spaces with the glitter hearts. Then I already had some red burlap ribbon so I tied that on as the hanger (I actually tied & glued that on first before gluing the hearts down so I could glue some over it). 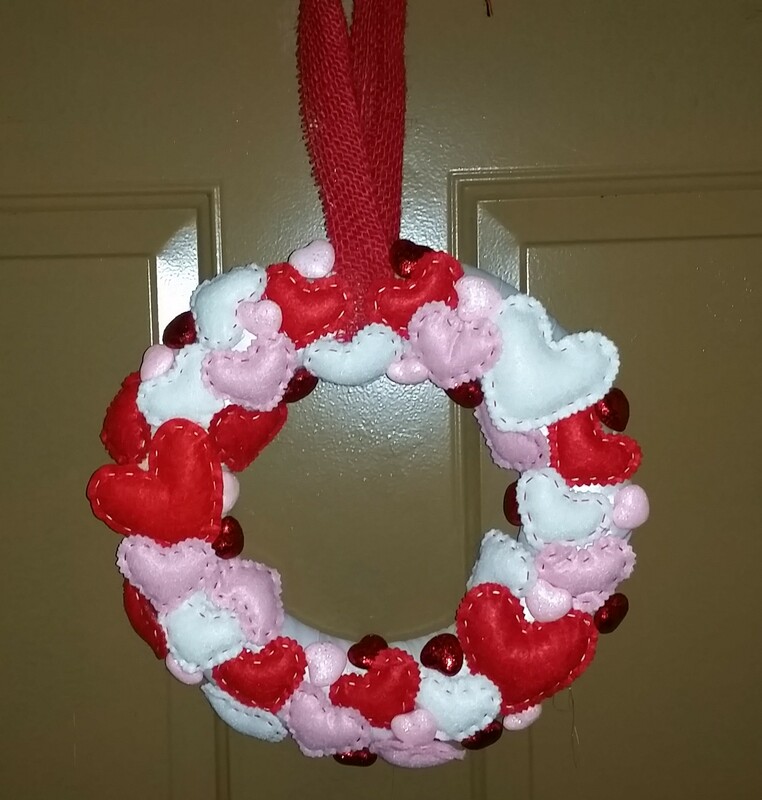 Categories: Wonderful Wednesday | Tags: 30 before 30, crafts, hearts, Valentine's, wreath | Permalink.